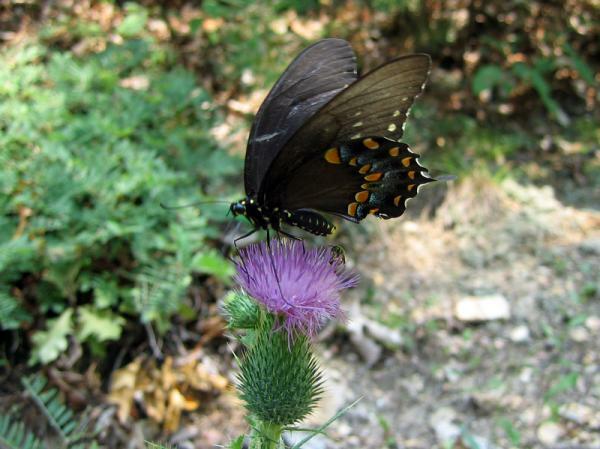 Spicebush swallowtails (Papilio troilus) are found throughout the midwestern and eastern United States. They are large butterflies with a wingspan of 3.5-4.5 inches (9-11.5 cm). Spicebush swallowtails are sometimes called green clouded swallowtails because of the green coloring on the males' hindwings. The hindwings of females are more blue than green. Adult spicebush swallowtails will drink the nectar from many types of flowers, but some of their favorites are butterfly bush, purple coneflower, butterfly weed and common milkweed, lantana, zinnias, honeysuckle, and thistle. They are also attracted to shallow mudpuddles. As their name suggests, spicebush swallowtail caterpillars feed on the spicebush plant (Lindera Benzoin). The larva also feeds on sassafras, camphor tree, and redbay. The caterpillar is quite unusual in appearance with its large eye spots. These eye spots help to protect the caterpillar from predators. Because the eye spots are so large, most butterfly predators assume that the eyes belong to a much larger animal than a caterpillar and so they generally leave it alone. 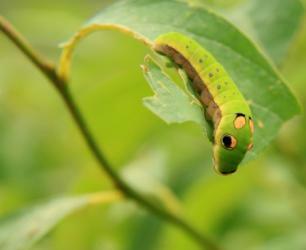 The spicebush caterpillar also protects itself by creating a shelter within the leaves of its host plant. Its shelter is a rolled up leaf that the caterpillar hides in when it isn't eating. The caterpillar creates a silk strand that it uses to roll up the leaf. The caterpillar goes through several stages (called instars), and shortly before it goes into the pupal stage, the caterpillar turns orange or yellow. The spicebush swallowtail chrysalis is either green or brown. If the chrysalis forms during the fall it overwinters in the pupal stage and emerges as an adult butterfly in the spring. The adult butterfly enjoys some protection from predators. Because of their similar appearance to the pipevine swallowtail, spicebush swallowtails are not often eaten by predators.